Charissa Vandikas started her music lessons at the Yamaha Music School at the age of 2. She was 4 when she began her formal piano studies, later also learning to play various instruments at school, including the recorder and the trombone. 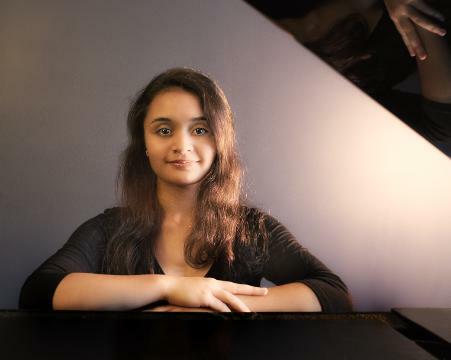 She has competed in various local, provincial, national, and international piano competitions, including the Ontario Music Festival Provincial Competitions, the Canadian Music Competitions, the CFMTA National Piano Competition, and the New York International Piano Competition where she earned several awards, scholarships and performance opportunities. She completed her ARCT diploma at the age of 13, and her Licentiate Diploma in 2015, attaining a level of First Class Honours with Distinction in both diplomas. Major influences include former teachers: Janice Lin, Sheila Vandikas, George Vandikas, Joe Ringhofer (History), Dennis Chan (theoretical subjects), and Dr. Michael Esch (Licentiate). Charissa performed her debut concerto performance with the Greater Toronto Philharmonic Orchestra in the fall of 2013. In 2014, Charissa won the North York Music Festival Founder's Award and scholarship entrance to the Peter de Grote Summer Academy in the Netherlands, where she received the HJSO Solo Award. In the same year, she won the ORMTA Young Artist Provincial Competitions and proceeded to the CFMTA National Competition in 2015 where she won first place. She has since performed both solo works and appeared with several orchestras in Canada, U.S, Europe, and Asia. Recently, she and her duo partner, Linda Ruan (La Fiammata piano duo) won the 2017 Canadian Music Competitions Grand Prix and has been named one of the Youth Ambassadors for the CMC's 2017-2018 60th Anniversary Concert Tour . Most recently, her duo won first place at the North-West International Piano Ensemble Competition. Charissa is a graduate of the gifted program at Rogers Public School, Newmarket and of the Arts Unionville Program at Unionville High School where she performed as both soloist and collaborative pianist. She has also played the trombone for Unionville High School's Symphonic Band, Wind Ensemble, and Jazz Band. She loves many sports, and played rep soccer with the Newmarket United A Girls team, and the school soccer team. She holds a black belt in Goju Karate, and likes to run and read in her spare time. She teaches beginner, intermediate, and advanced students at our studio. She is on demand as a collaborative pianist for both vocal and instrumental performances. She is pursuing a career in music and is currently completing her Bachelor of Music degree on full scholarship (the Janet and Bill L'Heureux Scholarship) with John O'Conor at the Glenn Gould School, Royal Conservatory of Music in Toronto. Charissa is the 2018 recipient of the Emerging Artist Grant from the Hnatyshyn Foundation.